KAREN Coles from Bromley Heath was only too delighted to join her 12-year-old daughter Grace in answering the call to Stand Up To Cancer. The pair were among dozens of adults and children from across the Downend area who took part in a Zumba event for the charity last month. For them it was personal as Karen was treated for cervical cancer in 2007 at the age of 38. “I had major surgery four weeks after diagnosis. Grace was six at the time and my son Michael was two,” she said. 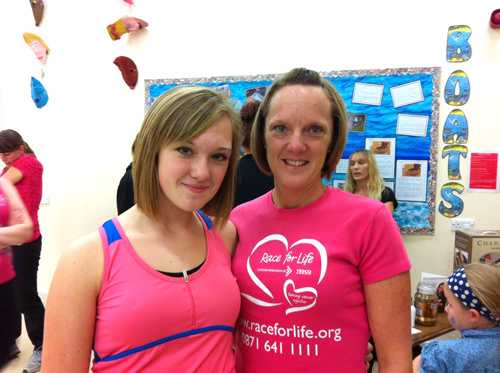 Karen was already a supporter of cancer charities and has taken part in the annual Race for Life for the last 15 years. “The only time I missed it was when I had my surgery; my twin sister ran it instead,” she said. These days she is joined by Grace and her friends, with whom she also attends regular Zumbafreak classes run by Debbie Griffin. “Thanks to Cancer Research UK I am here today wiggling and a moving with my beautiful daughter Gracie. All these amazing women here tonight are helping people just like me,” said Karen. But it was not only the women from the classes in Downend, Mangotsfield, Bromley Heath and Hanham who were involved in the fund-raiser, which was held at Blackhorse Primary School. 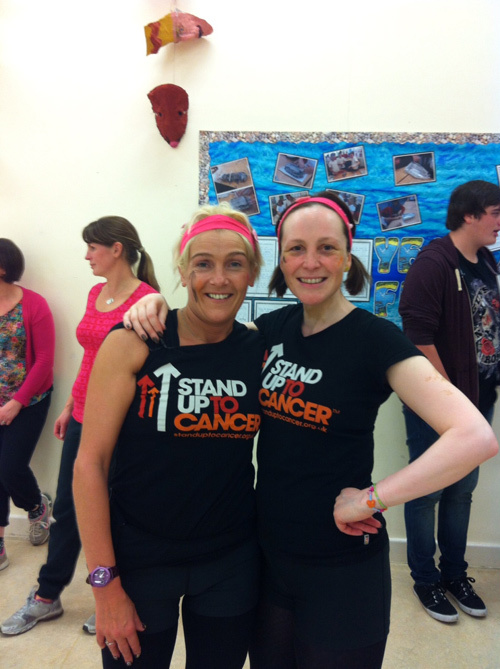 Debbie and Karen Davis also run after-school Zumba clubs at Blackhorse, Bromley Heath Infant and Christ Church Junior and Infant Schools and children from those classes showed off their Zumbatronic moves at the event, with all proceeds being donated to Stand Up to Cancer.